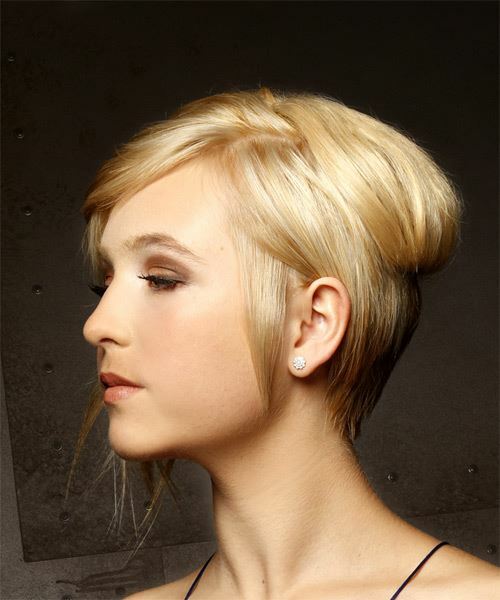 Our model is wearing a short and funky 'do that is cut short through the back and one side, while the opposite side is jagged cut and left slightly longer to achieve this asymmetric style. The mid-lengths are waved to create height, lift and texture for a fabulous finish. Product is needed to piece out the ends to create this look and keep it in place. This haircut is ideal for fine hair types that benefit from volume-boosting hairstyles. Twist wax through the ends to piece out this 'do. Apply gel-wax to your sides using your fingertips and mess the hair in a circular motion, piecing the ends out as you go and as messy as you like. For a softer hold, use only a small amount of gel-wax. Apply a small amount of gel-wax to your fingertips, then place it at the roots above your ear and drag it through as you pull your hair behind your ear. This will create a fresh, semi-wet result.